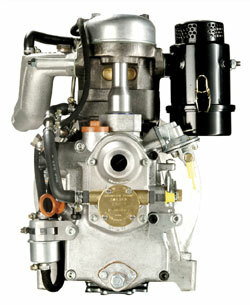 Single cylinder four stroke diesel engine, water cooled with direct injection system, save manual start with starting handle or electric starter motor, excess fuel device, automatic decompression, self-venting fuel system, mechanical governor, lubricating oil gear pump, dry type air cleaner or oil bath air cleaner, fuel filter, exhaust silencer or water cooled exhaust elbow, crankcase of high tensile light alloy, crankshaft / con rod bearing: plain bearings on all except flywheel end (roller bearing), cast integral engine feet, power take of flywheel end, environmentally friendly by using internal crankcase breathing and valve stem seals. The engine is also available in air cooled version as 15 D / 18 D.
Oil bath air cleaner, fuel filter, fuel lift pump, cooling water pump, exhaust silencer, operator`s manual. Dry type air cleaner, water cooled exhaust elbow, electric starter motor, alternator, solenoid valve, oil pressure switch, anti-kickback starting handles, different flywheel housings, flanges and couplings, EPA-certificate. Derating 1% approx. every 100 m altitude and 2% approx. every 5°C above 20°C. Ratings certified within tolerance of 5% after running-in and operation with muffler and standard air cleaner.